The carpet beetle larvae start to feed as soon as they hatch. The adults are about 1/16 to 1/8″ (2.0-3.8mm) long; oval in shape. Black body with pattern of whitish and orange/red scales. 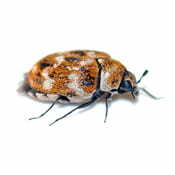 Carpet beetle larvae feed on a variety of animal and plant products. Products like furs, silk, dead animal horns, feathers, hair, rye flour, wheat, and bug collections. The adults (pictured above) are most often the ones seen as they fly during the daytime and are found in and around window sills.